Product prices and availability are accurate as of 2019-04-02 01:33:47 EDT and are subject to change. Any price and availability information displayed on http://www.amazon.com/ at the time of purchase will apply to the purchase of this product. Perfect! Suspenders fit with bow tie! You will be looked more handsome! More gentlemanlike! When our bow tie and suspenders appear with you at the same time! Classic bowknot design, show you a perfect, classical, and nobility. Two level fabric, high quality material, stereo style and bright and colored surface, will give you a fashion view, and this kind of fabric has two special function: stretchability and anti-wrinkle. 29 machine process, handmade only, Inheriting traditional European manufacturing process, high quality fabric, every bowtie is been carefully crafted out, only for putting the quality of life, fashion and business together perfectly, special selection. With two metal length adjusters, you can easily stretch these suspenders to conform comfortably to your body. They will stretch up to 45" and fit almost any men and women who needs them. The strong clip grasp your pants tightly, prevent slipping, and do not hurt your pants. We promise that our products are exactly like the picture in Amazon web. If you have any questions, please kindly do not hesitate to tell us, we will try our best to make you satisfied. MATERIAL&SIZE: Our material is high quality Polyester. High Quality Classic Style Bowtie and suspender Perfect For Any Occasion. Fully Adjustable to fit neck sizes from 12 inches to 23 inches can be adjusted to fit teen boys to adults. Suspenders made by 75% polyester 25 % elastodiene. Strong on material and enough strength to do an effective job! Great quality, many perfections effect on adjustment, one size fits all, up to 45",width 1.38" , suitable for ladies and gentlemen MANY COLORS: There are many available colors of SUNNY OCEAN Bowtie and suspender set, bowtie fit with suspender, perfect! Various colors could fit any color of your pants and shirt, every color is special for you. You will find one kind to fit you. They are suitable for formal occasion, such as wedding and party, also is perfect for daily life, you will enjoy the fashion every day. 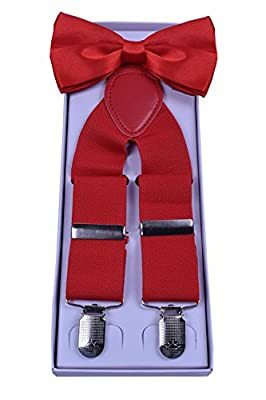 SUSPENDERS' STRONG CLIPS: The clips on our suspenders are very strong and will greatly hold the waist band of your pants very well and will not hurt your clothes and releasing your trousers. 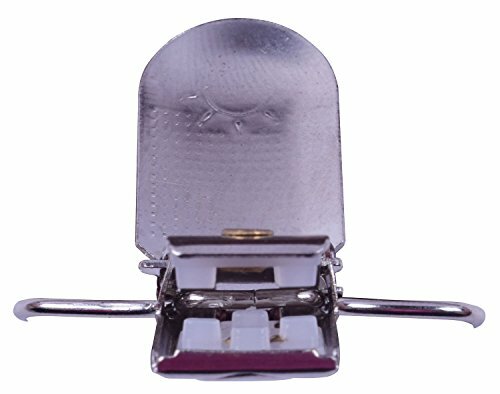 Clips clamp pants strongly , you could wear it relieved, and don't worry that the clasp exploded and flew everywhere. The. Also they easy to operate, beautiful, glisten and not fade. ACCESSORIES: High quality accessories on belt is made from high quality and fine artificial genuine leather, they are fashion and environmental, no weird smell, they could prevent slippery, and the toughness is good. SUNNY OCEAN Suspenders need your kindly caress to keep beautiful, so Please hand wash with mild detergent. Please tell dry cleaner that should focus on the dirty part of the bow tie and suspenders. o not wash by machine. Exposed to the sun to avoid the sun. Cool dry storage.